How do you beat people that would leak your product before you are ready to let them see it? Answer – make multiple versions so that even the players involved have no clue which way you are going to jump. I wrote an article earlier about how this is already a tactic GOT employs – it sets up, through hints and red herrings, a series of possible outcomes for each character that keeps your guessing. In comparison the other big TV event this year, Twin Peaks opted for surrealistic overlapping fugues and surrealistic imagery, with an expanding mythological template that was like the televisual equivalent of jazz, in that even though you might be able to guess some of the tunes yet unheard qualities, you were hardly unlikely to be able to accurately predict what Lynch was going to pull out of his bag of tricks. Game Of Thrones unpredictability is firmly grounded in the complexity that has been built into the characters, more solidly even that the politics that exist between the many houses. Loyalties and allegiances shift, and often undisclosed motives drive the characters to do things that, though they make sense given the events that have gone beforehand, aren’t something you would have necessarily picked as being the selected path. When new episodes are due to air my Facebook feed is full of people requesting that their friends and acquaintances refrain from posting any spoilers (I’ve seen people unfriended for being so inconsiderate) and this to my mind is a similar protection of the experience for those yet to watch it. I like the anticipation myself – I have always hated those trailers that give you all the keynotes of the movie, so that you’d have to be an idiot not to work out the structure and outcome of the entire film. Despite the sometime implication that these are highlights, and that there is more to the film, it often proves to be the case that the trailer makers have done what you asked all your friends not to do – they spoiled the film for you. Speculation, fan trailers, high-blown theories about a movie before its release – all these things are great … they help market the movie and generate interest, and can occasionally get the sequel a green light before the first weekend’s Box Office is in (not that this would likely stick if you have a turkey on your hands, but anyway). I somehow managed to scan over and avoid all of the real meat about Game Of Thrones before I binge-watched my way through six seasons of the show, and caught up to the weekly installments of the shorter seventh season, but it is a pretty big hazard in the deluge of information that you receive about all media products these days. Once Facebook and Google have the drop on the kind of things that you buy and watch and read, and they pummel you with associated products, so you sometimes have to employ a kind of squint-eyed corner of the eye censorship and active forgetting of what you might have learned about something you want to come to fresh. It’s odd because I also write elsewhere about forthcoming books, movies, and albums, that are approaching, but I kind of want to do something skin-deep so I don’t lose the magic of the first experiencing of a thing for myself. I am not sure if I am alone in this, but I don’t like the trend for people who get to see a movie first crapping all over it before someone gets a chance to make up their own mind. It may not be your cup of tea, but sometimes what some people see as a bad movie isn’t viewed in the same light by others. Save your money, they say, and I saw it so you didn’t have to. And I sit there, and I want to reply: What happened to the holy command of Thou Shalt Not Post Spoilers? Telling someone a movie is terrible is a spoiler. 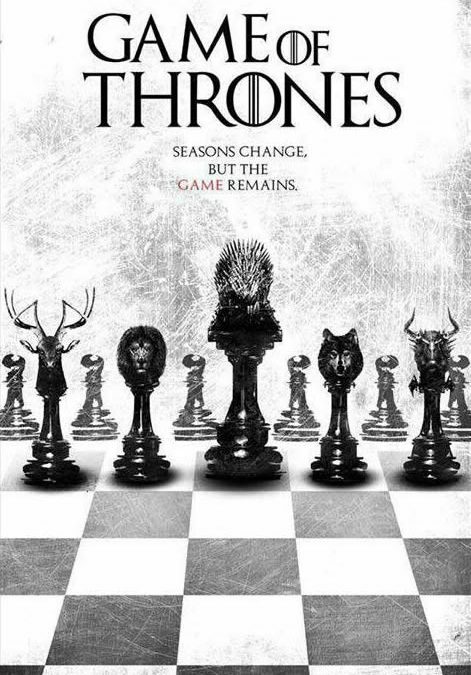 Back to the subject in hand – I think Game Of Thrones solution is genius. And I think it is necessary. Over 8 seasons you get invested. I don’t want the Walking Dead cliffhanger solved for me, thank you. I want curveballs galore. On some level the logistics of travel times between places in Westeros mean diddly squat to me, when the human and emotional distance traveled is the really important thing in the show. From a writer’s perspective I have hopes that they will reveal all the considered endings in the DVD, and that the Behind The Scenes show explores the reason for the final choice, because understanding that decision making process is very enlightening. And once that is done, whether it comes before George R R Martin’s conclusion or not, we then get to see how the author who set the ball rolling chooses to end his epic saga as well. Don’t get me wrong, it really is a great marketing ploy, that is going to generate, as have all the other series, a lot of speculation, but just with the way the market is currently, with demand provoking all kinds of criminal responses to undisclosed art. it is a very smart business strategy as well. The viewer cannot lose (well, unless, after seven series, they somehow fail to deliver).